Own limited-edition recordings from the Dead Can Dance European tour of 2005. Only 500 discs will be made of each of these thirteen shows. 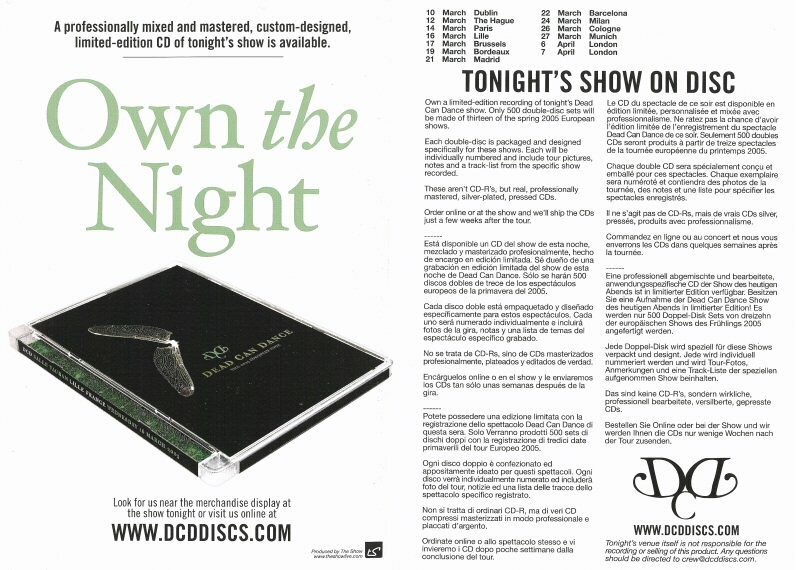 These are not CD-R�s, but real, professionally mastered, silver-plated, pressed CDs. Each package will be individually numbered and include pictures, art and notes from the tour and a track-list from the specific show recorded. We take a digital, unmixed feed from the board at each show and then go into a studio and painstakingly master the mix before making discs. The results are amazing and far superior to almost every live recording or bootleg you've ever heard.